I was several days into my time in Sagaing Hill, but I felt that I had only begun to explore the area and its culture. It was a place rich with history and faith and wandering its streets and pathways, I felt that I could spend years there and only begin to understand the faith and its teachings. Single shot, additional exposures for highlights, focal length 70 mm, aperture f/11, shutter speed 4 seconds, ISO 64, tripod. Again and again I climbed to the top of Sagaing Hill, often to photograph the city, but sometimes simply to find a quiet place and think. Myanmar tends to inspire that in a person; surrounded by temples and hundreds of monks and nuns, it’s hard not to feel contemplative here. On a particularly warm evening, I made my way to the top of the hill, took some photographs overlooking the city, and sat down in the shade of a tree. Before me was a view that I had come to love — the golden stupas of Sagaing Hill glittering like gemstones in the sunlight and the great Irrawaddy River flowing in the distance. I thought of Gautama himself, who found enlightenment as he sat underneath a Bodhi tree. I won’t claim any kind of special insight or mastery of a spiritual discipline. I can’t say for certain what kind of tree I sat under. But as I sat there, looking over the hillside and the river beyond, I felt an ancient peace settle over me. In my case, it was the peace that comes from a deep contentment with the present and a profound appreciation of beauty. 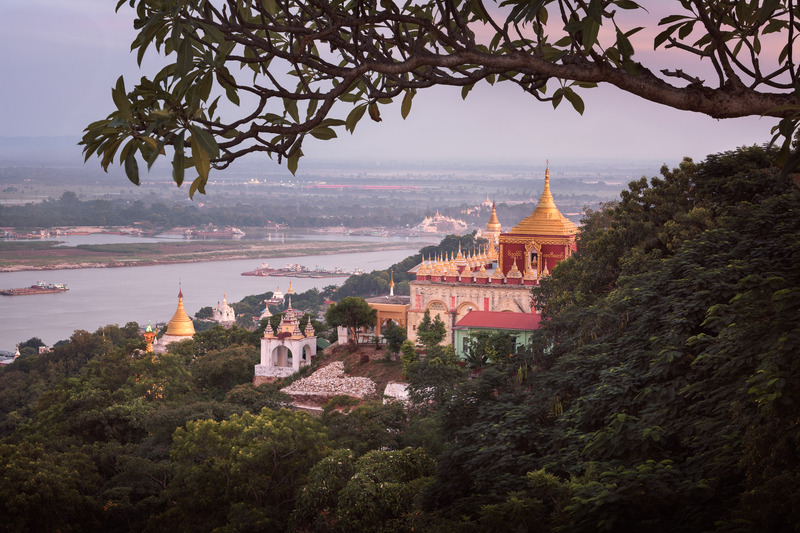 There is something very special about Sagaing Hill; it was easy to see why so many devout Buddhists are drawn to the place. I was in no hurry and had nowhere else to be. I settled myself against the tree and prepared to spend the afternoon admiring this beautiful, serene bit of creation. This entry was posted in City and tagged Myanmar, Sagaing.